The recent announcement of the revamped Speedmaster MkII from Omega seems to highlight a return to the company’s glorious past- and rightly so, in my honest opinion, since Omega has a large number of design gems in its vaults. However, it was the introduction of the Z-33 spacemaster that made me want to dig some more and present to you the highly radical Flightmaster, a watch that, when it was introduced in 1969, was considered way ahead of its time. Maybe it still is…. The 1960’s undoubtedly were hugely important for the Swiss watch industry; this was a memorable decade for chronographs and the other “tool” watches. The watch became the symbol of the adventurous human spirit, being worn by drivers and their crews when they went racing; by pilots as they broke speed and altitude records; by international travelers as they crossed the time zones of the world; by divers doing underwater exploration; by the adventurers as they climbed the tallest peaks. Especially in the field of chronographs the competition was intense. Omega, Breitling and Heuer competed with each other. 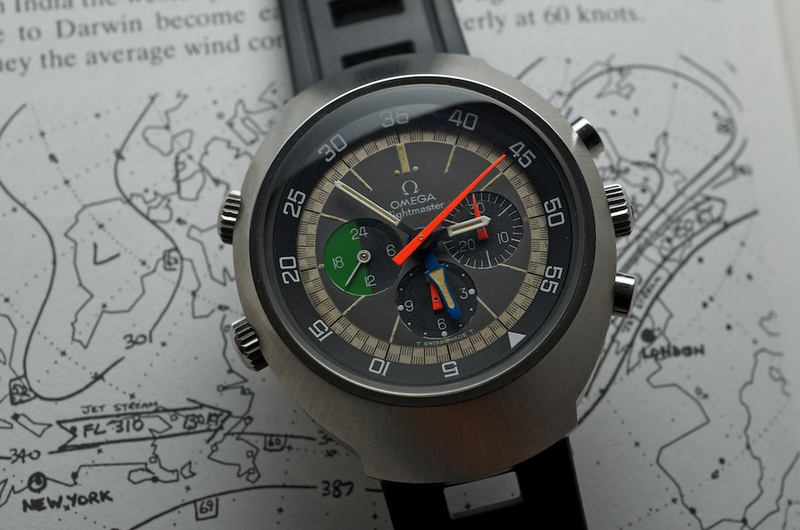 Omega introduced the Speedmaster in 1957. 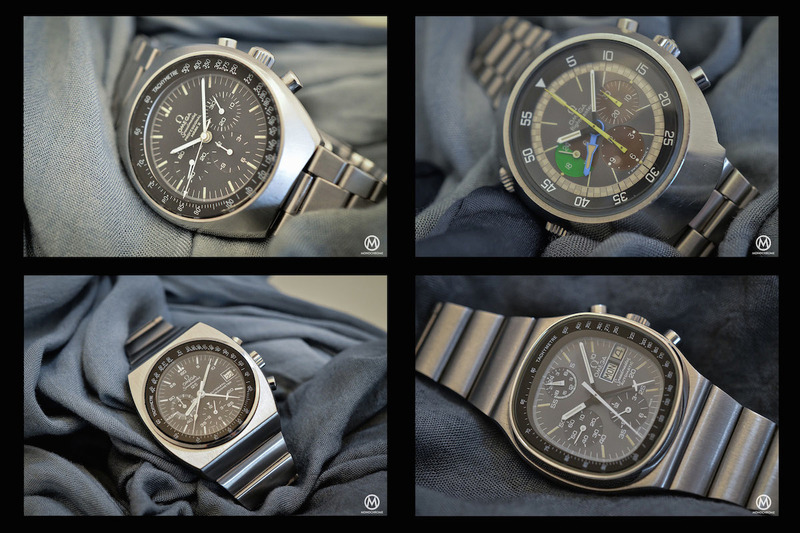 By the end of the next decade, the “Speedy” was worn on the moon. Breitling proclaimed that it was the world’s leading manufacturer of precision instruments for aviation, with the Navitimer and the Cosmonaute. 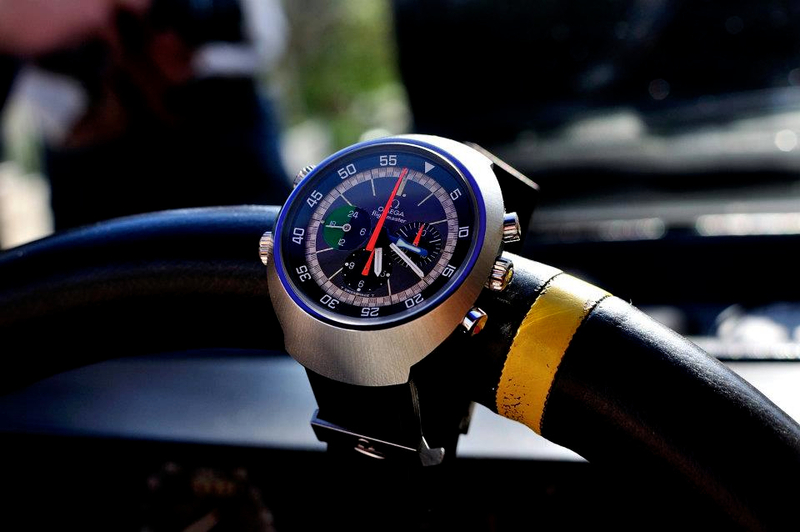 Heuer was the most dominant brand in racing, offering chronographs dashboard instruments and stopwatches. Indeed, “tool chronographs” seemed to be coming into their own in the early 1960’s, with the leading brands developing purpose-built chronographs for an increasingly wide variety of demanding applications. 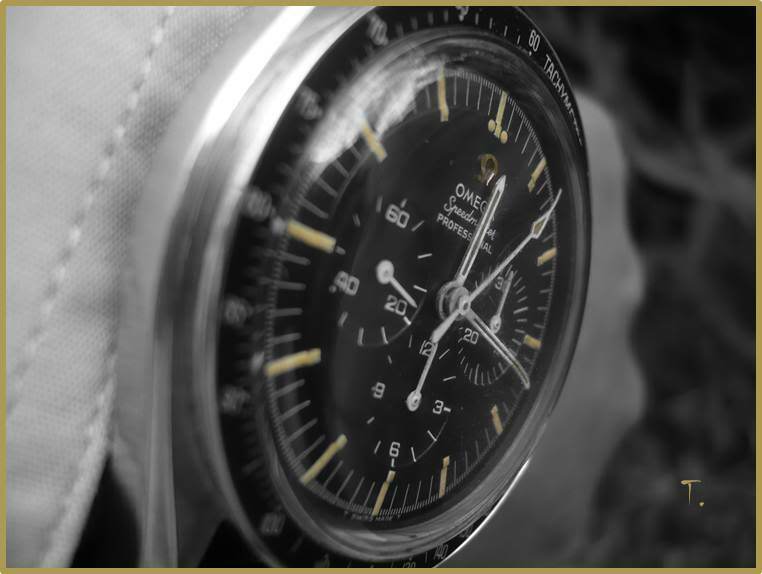 In 1969, while the Swiss industry giants were preoccupied with developing the first automatic chronograph, Omega introduced in its catalogue a weird looking object, with a highly distinctive over-sized case, 3 crowns, 2 pushers and 7 (!!) hands. 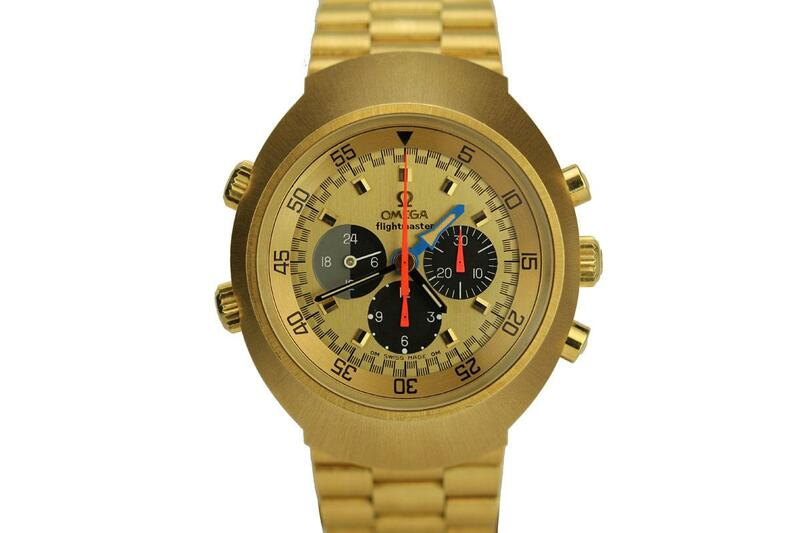 This radical chronograph was the iconic Flightmaster. A bold product placement from a company that never stopped introducing weird looking but highly functional watches (Ploprof anyone?). 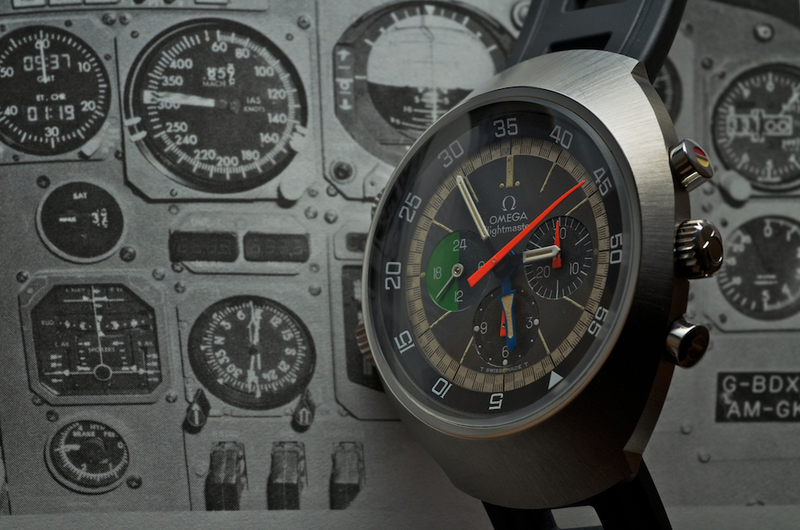 So, in the year that led the Speedy go down in history as perhaps the most iconic chronograph of them all, what made Omega design and sell the flightmaster? A watch that challenges the onlookers by its duality (highly radical but extremely functional). 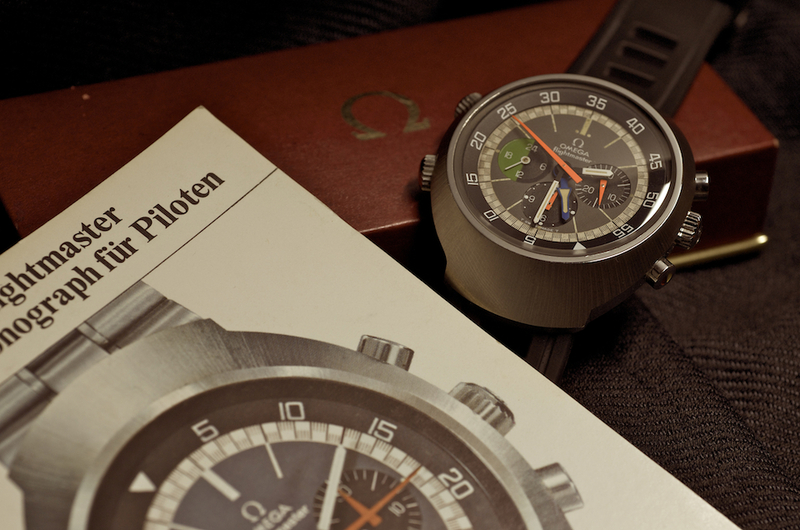 The Flightmaster is a variant of the Speedmaster line; it was designed, engineered and marketed towards “pilots” by Omega from 1969 through the early 1970’s. Omega period literature referred to the Flightmaster as a ‘Pilot’s watch that has rather more than a revolving bezel,’ a statement which actually held the purpose of showing to the market the superiority of their model in relation to other popular GMT watches like the Rolex GMT or the Glycine Airman. In these the second hour hand was not independently adjusted, so in order for the operator to see the second time zone, he had to use the revolving bezel as well. The Flightmaster though, has a 12 Hour-GMT complication. The hand moves independently and is set through the auxiliary crown located at 10 o’clock on the case. In its case back omega put the outline of a DC-8 super 61 jet. 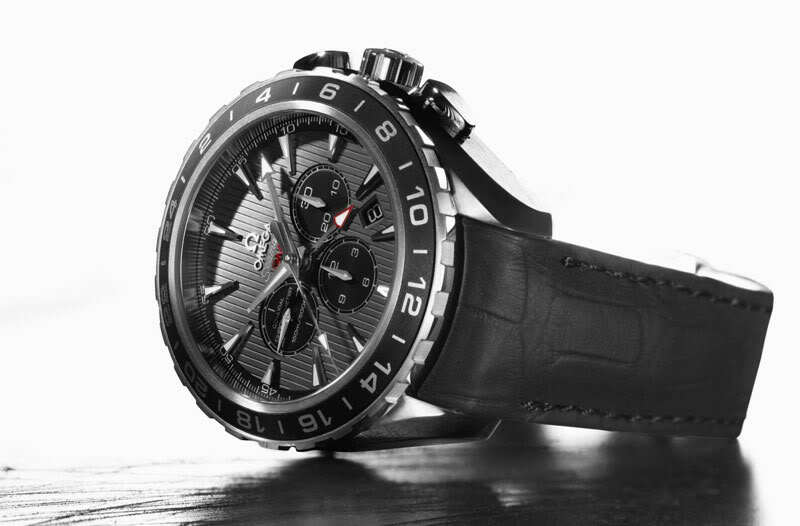 The chronograph incorporated a patented retaining crystal system and it was waterproof for 6 atmospheres. After the movement had been inserted into the case and the stainless steel back screwed into place, the tempered mineral glass crystal was sealed in position by a unique jointing system. The watch has been tested under space conditions and works even in a complete vacuum. Actually the Russian Cosmonaut Alexei Leonov wore an Omega Flightmaster (ST145.036) during training for his command of the first crew for the first joint Soviet-American space mission under the ASTP program (Apollo-Soyuz Test Project). During the second mission (17/7/75) that was under his command, the Soyuz spacecraft docked with the US Apollo spacecraft – the first docking ever between two spacecraft from two different countries. The second striking characteristic of the watch was its dial. 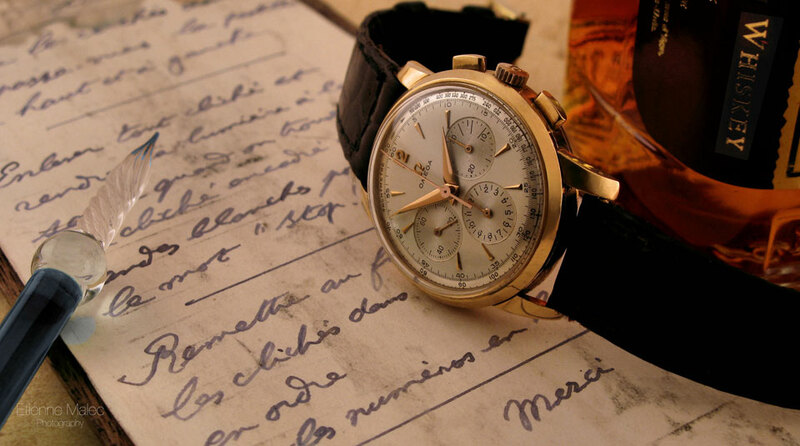 Although it seems quite overwhelming, the Flightmaster is one of the most legible and simple chronos ever devised. The flightmaster was the first model, which incorporated the colour-coded pushers. The auxiliary crowns on the left side of the case have a circular indentation in them and are colour-coded to their function… Blue for the second hour hand, black for the under-crystal bezel. In addition, the pushers on the right side of the watch also have indentations on them as well and have yellow/orange paint on them. These are colour-keyed to the sub-register hands that indicate chronograph elapsed time. Another fact that stressed the attention to detail that the Omega engineers dedicated to the watch was that special ‘professional’ versions were supplied with yellow cadmium coated hands which were extra legible when aircraft cockpits were lit with infra-red lights. 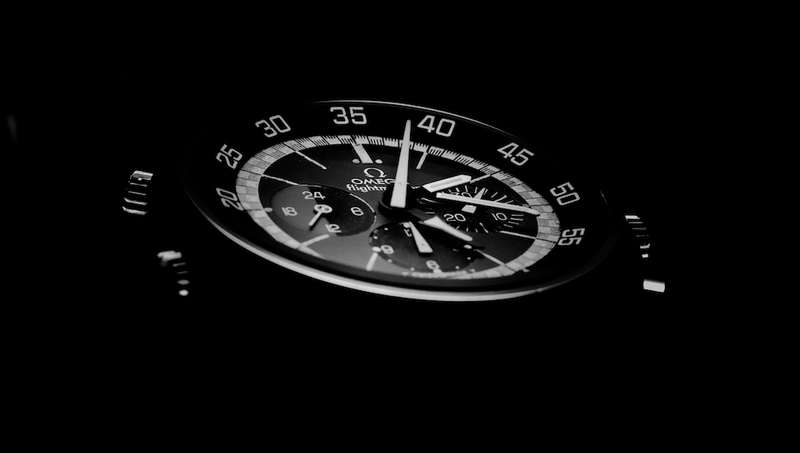 At the heart of the Flightmaster (145.013) lies the calibre 910. The 910 (17 jewels and 21.600bph) is a manual wind calibre with 3 subdials (12h, 24h display and 30min) plus the independently set GMT hand. Actually the movement is a highly modified calibre 861, the brainchild of Albert Piguet. The lineage of this specific calibre is quite interesting. Omega launched the 27 CHRO C12 (27 is the movement diameter, CHRO is an abbreviation for chronograph, while C12 refers to a 12-hour timepiece) project jointly with Lemania in 1942, which led to the development of the new cal. 321 movement. This in turn was replaced in late 1968 by the cal. 861, which had some important differences. Firstly the chronograph function was simplified from a column wheel to a shuttle/cam system. Secondly, the balance wheel was changed from a screwed balance to a smooth balance, which allowed an increase in the frequency from 18,000 bph (2.5 HZ) to 21,600 bph (3 HZ). Lastly a flat balance spring was utilized, while the shape of the bridge also changed. The Lemania 1873 or Omega 861 became the workhorse movement for Omega and proved its value in the harshest conditions ever imagined -namely, space flights. So, with few alterations it was a logical choice for the Flightmaster. 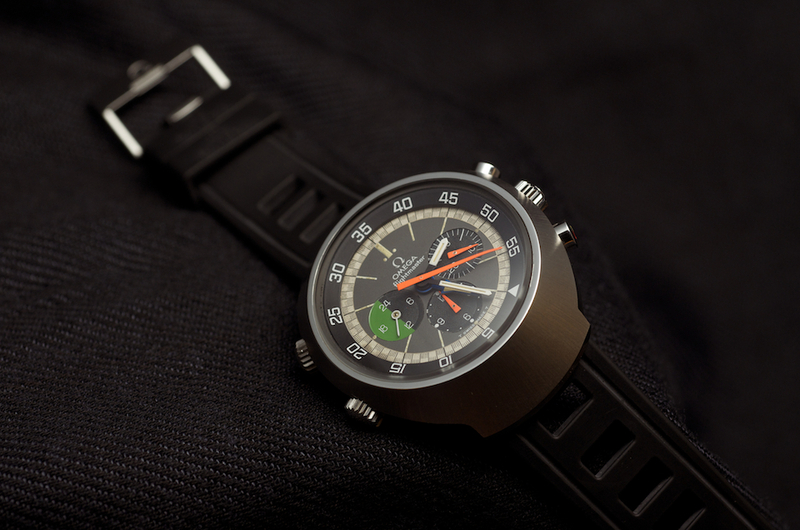 The ref 145.013 was built in two variations: one with orange hands and one with yellow cadmium coated hands. In parallel one more variation of the 910 Flightmaster was the gold model (both case and bracelet) with ref BA 345.0801. This was probably one of the heaviest pieces built (250 grams), with only 200 pieces produced (with some sources lower this number to 40). The first of these was delivered to King Hussein of Jordan. 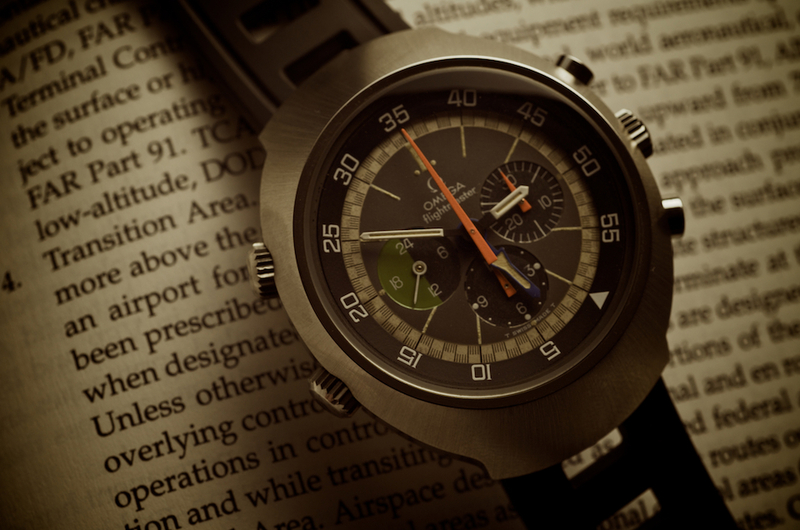 In 1971, Omega decided to change the Flightmaster. Many complained that they could not see if the watch was working or not due to the absence of a constant second hand. Another variation of the immortal calibre 861 was produced, this time with the running seconds on the 9 sub dial, the calibre 911. The reference number changed with two variations as well, the 145.026 and the 145.036. The .026 had orange hands and a flat crystal this time, while the .036 had the cadmium coated hands, a round heavy duty O-ring that safeguarded that the crystal would stay in place if a sudden decompression occurred in the cockpit of an aircraft, while the waterproof rating was raised to 12 atmospheres. While under the shadow cast by the iconic Speedmaster, this watch has nonetheless played an important role for Omega by allowing the company to have a product in its catalogue that is specifically made for pilots -something to compete with Breitling’s Aerospace models. There have been two attempts/models that can be considered the spiritual offspring of the Flightmaster. 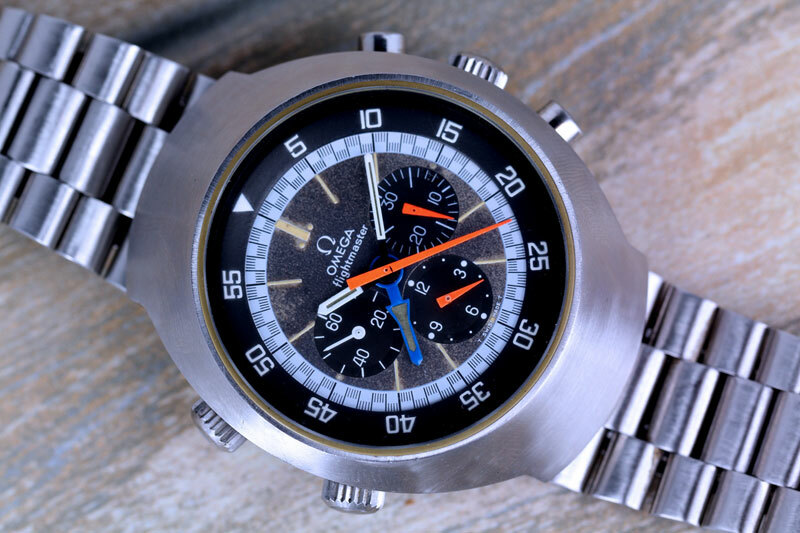 Since the 70’s, Omega has developed and introduced for sale the Speedmaster Professional X-33 “Mars Watch,” which is Quartz movement watch and the spiritual successor to the Flightmaster. In fact, early beta versions of the X-33 were even called Flightmaster, and were so marked. 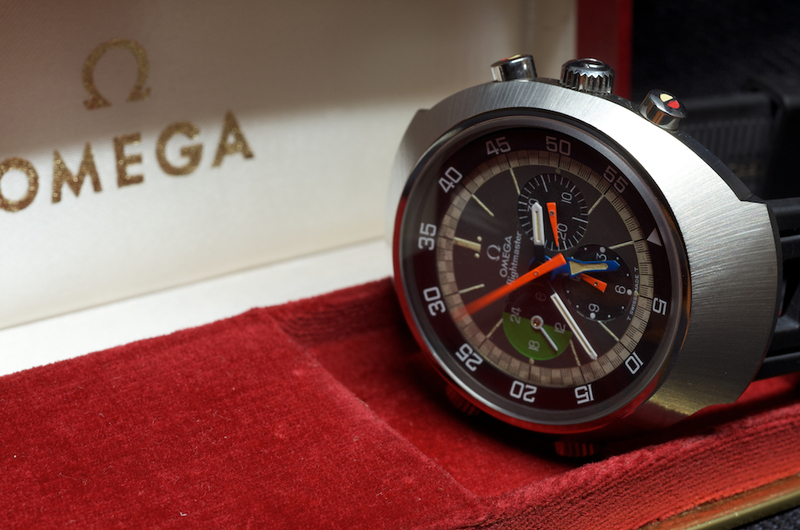 The second attempt is much more recent and was promoted by Omega as the Z-33 Spacemaster, which was reviewed by Max Reddick. The Flightmaster has a somewhat undeserved reputation with some as being a “Monster-sized” watch, while others complain about its ‘complexity.’ I beg to differ: the Flightmaster is perhaps the ultimate pilot chronograph. Every part of the watch has been carefully considered and the chronograph born of the research design and development is a practical instrument – specially made for the pilot. 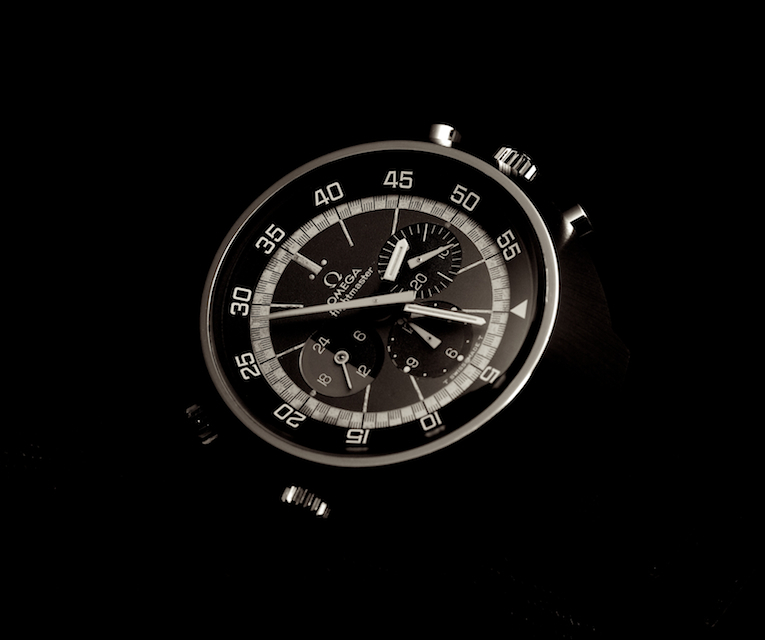 True to its raison d’etre (producing chronograph tool watches), Omega never side-lined the construction and offering of more specialized tool chronos, and while all fall under the heavy shadow cast by the immortal Speedmaster, they nevertheless are truly unique. 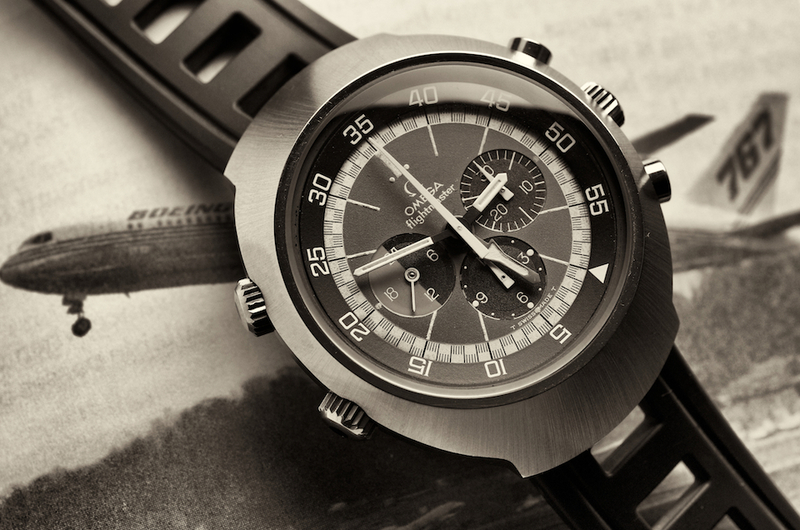 Perhaps the Flightmaster is the most exotic pilot chronograph of them all. Its size and overall design and surely the timing of its introduction make it a watch which even today never ceases to astonish watch connoisseurs. This article is dedicated to Evangelos A. What to say about this truly unique timepiece that is not already mentioned within this great article or presented through those stunning photographs. Maybe the most amazing thing about this watch is that besides its tool look and purpose it surely remains a delicate piece of art with wonderful curves, beautiful satin vs. brushed finish, colorful elements and all those details. I just consider myself lucky that i had the chance to examine one in the past. Looking forward for more articles like this one. Keep up the good work. 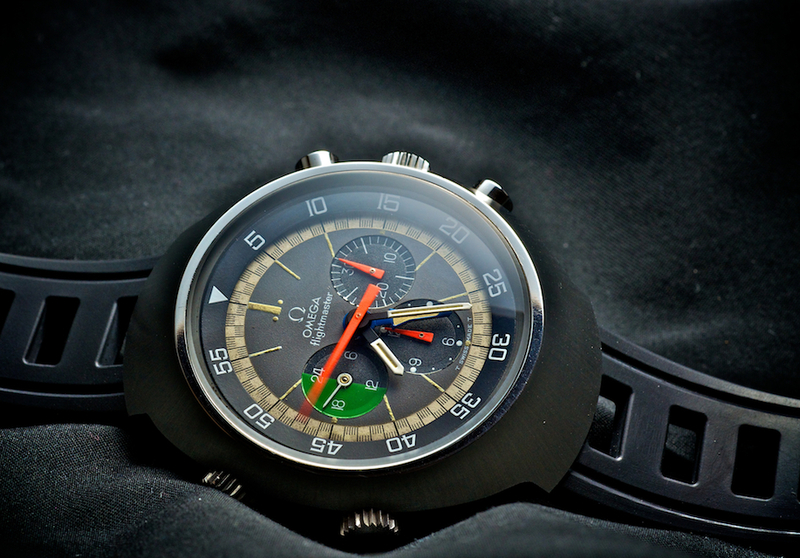 A breathtaking in depth review of a timepiece that never ceases to amaze 45 years after it was first launched. I am sure Evangelos A. is overwhelmed with pride for all of us. 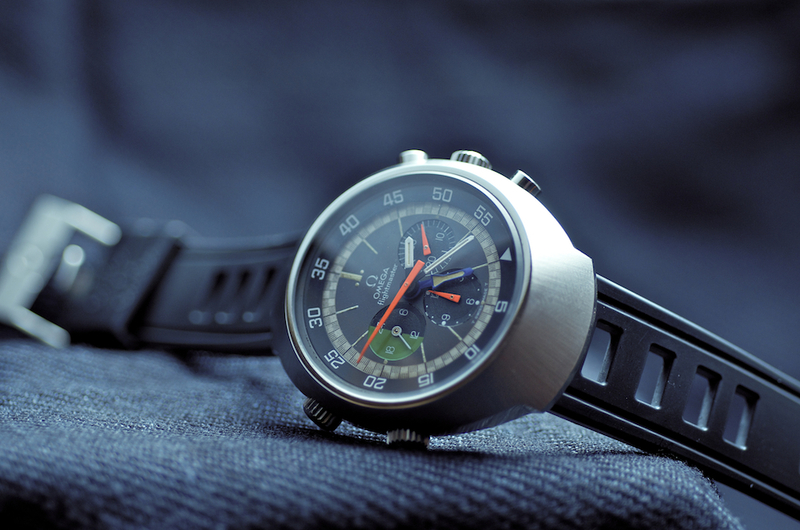 Great article on a iconic timepiece. Congratulations Ilias, I can’t wait for more articles like this! I have a flightmaster and the winding stem came out of the watch. How do I get it back in? The screw that holds the stem is loose, and you best take it to a watchmaker who can fix this. I would like to trade my Flightmaster for a Tudor Pelagos or an Omega Big Blue. Seamaster 120. I have this watch and am looking to sell….what is the current value? I have today just purchased The Iconic Flightmaster Mk1 which condition wise could only be described as in excellent condition…. I have been looking for the right watch at the right price since I saw this model watch in the Omega shop in the Burlington Arcade in London Five years ago at a cost of around if I remember rightly approx. £ 5000.00…. Today I paid just £2,000.00….. I am over the moon…. The Ploprof Straps are 24 instead of 22mm needed for the Flightmaster, right? What strap is this? I know it has been almost 1 and a half years since you e-mailed your query, but did you ever get a response on the width of the original Ploprof strap?! ?